This volume offers new and challenging interdisciplinary approaches to the use and study of literary archives. Interrogating literary and archival methodology and foregrounding new forms of textual scholarship, the collection includes essays from both academics and archivists to address the full complexity of the study of modern literary archives. The authors examine the increasing prominence of archives and their importance to the interdisciplinary study of textual history in the 21st century, exploring both emerging and established areas of literary history. 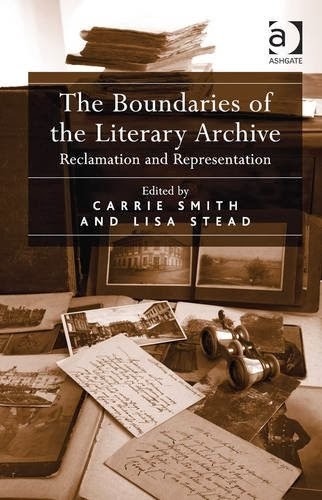 The book is marked by its attention to four distinct core threads that allow the authors to traverse a range of historical periods and literary figures: archival theory and textual production, authorial legacies and digital cultures, gender issues in the archive, and the practical concerns of archival research and curatorship. By offering an investigation of material from a range of historical periods within distinct methodological groupings, the volume seeks to encourage interplay between scholars working in different fields around similar essential questions of methodology, whilst presenting a rich account of archives worldwide. Contents: Introduction, Lisa Stead; Part I Theorizing the Archive: The archaeology of the manuscript: towards modern palaeography, Wim Van Mierlo; Allusion and exogenesis: the labouring heart of Samuel Beckett’s Ill Seen Ill Said, Iain Bailey; Original order, added value? Archival theory and the Douglas Coupland fonds, Jennifer Douglas. Part II Reclamation and Representation: Untrustworthy reproductions and doctored archives: undoing the sins of a Victorian biographer, Isabelle Cosgrave; The double life of ‘the ghost in the garden room’: Charles Dickens edits Elizabeth Gaskell, Fran Baker; Lost property: John Galsworthy and the search for ‘that stuffed shirt’, Simon Barker; Poetry and personality: the private papers and public image of Elizabeth Jennings, Jane Dowson. Part III Boundaries: Illustration and ekphrasis: the working drafts of Ted Hughes’s Cave Birds, Carrie Smith; Letter writing, cinemagoing and archive ephemera, Lisa Stead. Part IV Working in the Archive: To reveal or conceal: privacy and confidentiality in the papers of contemporary authors, Sara S. Hodson; Teaching the material archive at Smith College, Karen V. Kukil; ‘What will survive of us are manuscripts’: archives, scholarship and human stories, Helen Taylor; Index. About the Editors: Carrie Smith is a lecturer in English Literature at Cardiff University, UK. Lisa Stead is a Lecturer in English and Film at the University of Exeter, UK.